The Multi-Crystal Laser is a Rift weapon and is part of the Riftwalker Set. Take a smashed Crystal Tower, add a healthy collection of high technology scavenged from the most powerful Burroughs Rift mice, sprinkle with a dollop of Digby ingenuity, and what do you get? Terrifying Crystal Laser technology that brings Rift Power traps to the next level! 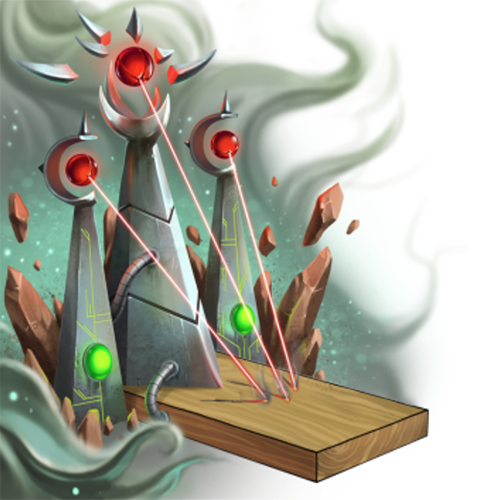 This variant of Crystal Laser technology splits the laser into three separate beams, useful for covering more area, and ensuring the smaller, less powerful Rift mice don't sneak through. That, plus the 3 Luck makes this trap great for catching the majority of Rift mice, but less effective against the tougher bosses. The Multi-Crystal Laser can be purchased from the Burroughs Rift Trapsmith for 1,500,000 gold, 1 Shattered Rift Crystal (from smashing a Crystal Tower worth 4,900,000 gold), and 50 Rift Circuitry, but only if the hunter has obtained the Null Gauntlet (looted from The Menace of the Rift). It cannot be refunded. Crystal Tower – Source of Shattered Rift Crystal required for purchasing the Multi-Crystal Laser. 9 September 2014: The Multi-Crystal Laser was released with the introduction of the Burroughs Rift.